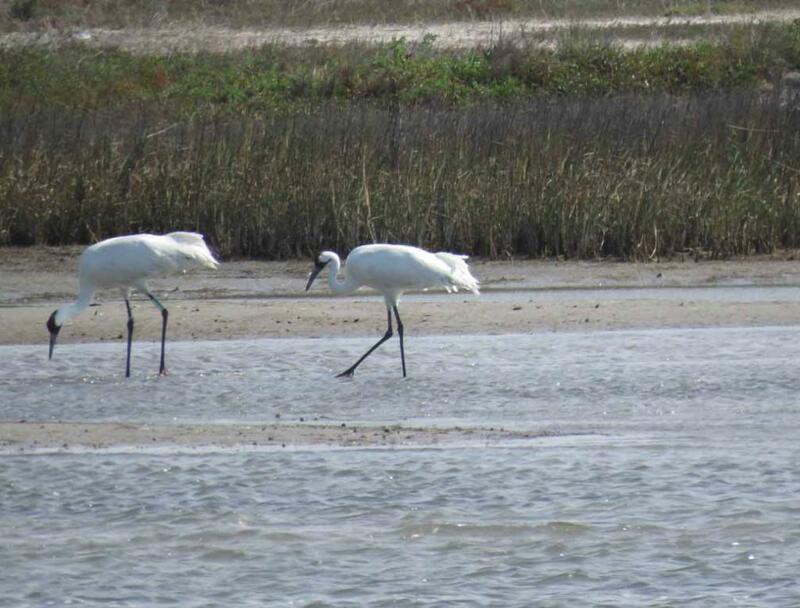 Coast from January 23, to February 4, 2015 to see many interesting birds and other wildlife. 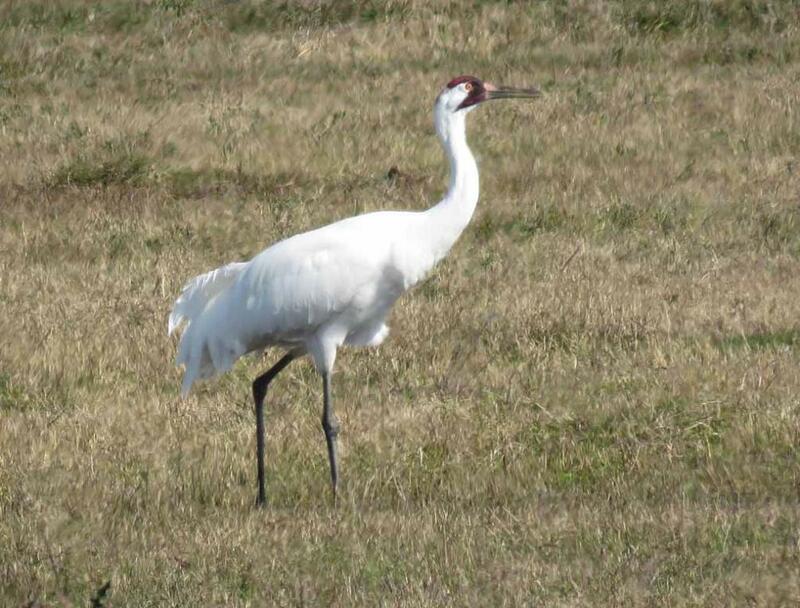 The whooping crane is the tallest North American bird, stands up to 5 feet and have a wing span of 7.5 feet. 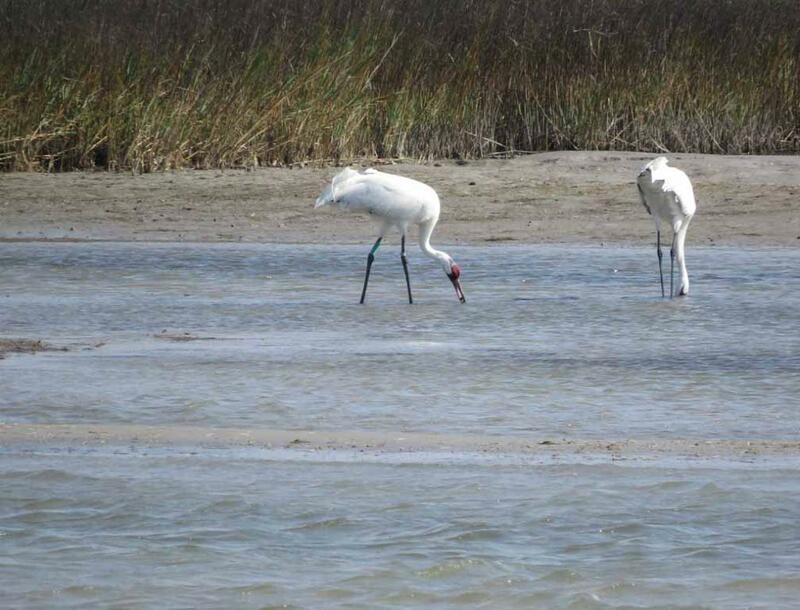 Refuge (NWR) and nearby areas a few miles north of Rockport on the Texas Gulf Coast. 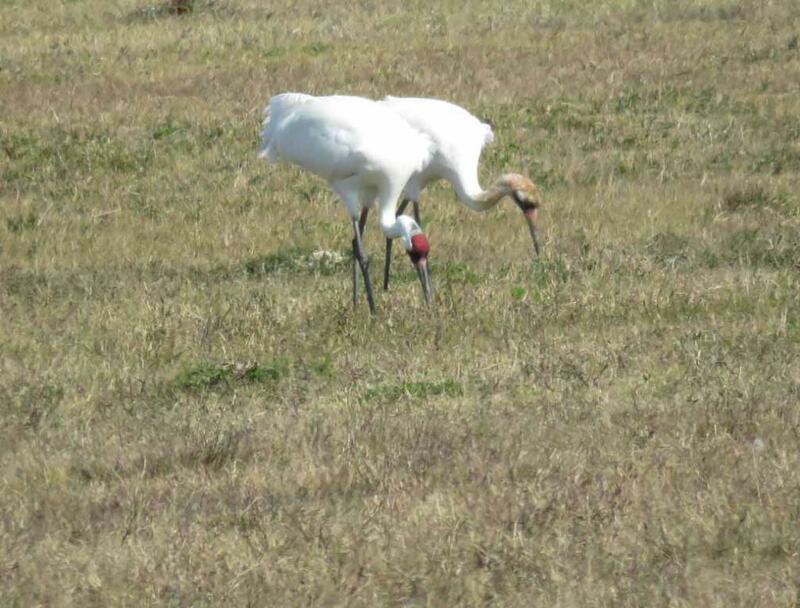 feeding in the middle of this grassland. 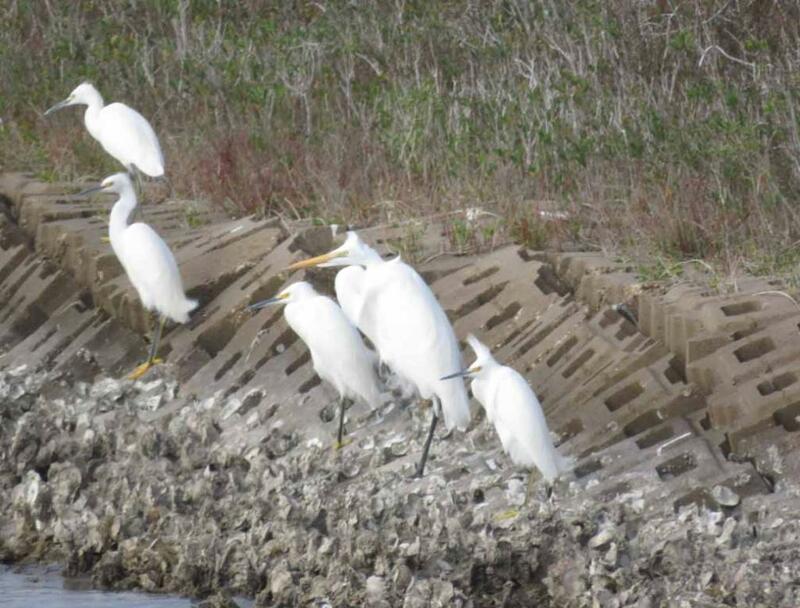 (Lamar Bay and Saint Charles Bay) on east side, 8th Street on south side and Palmetto Street on west side. 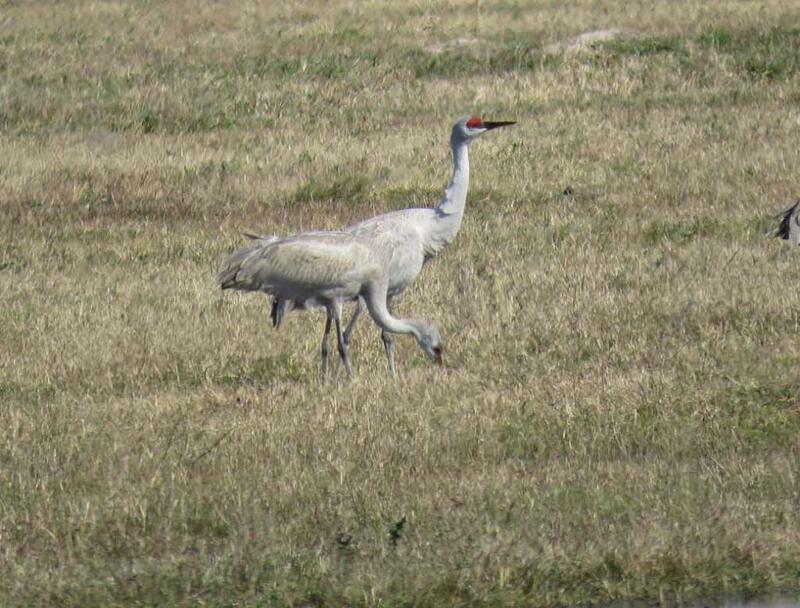 where most cranes are feeding. 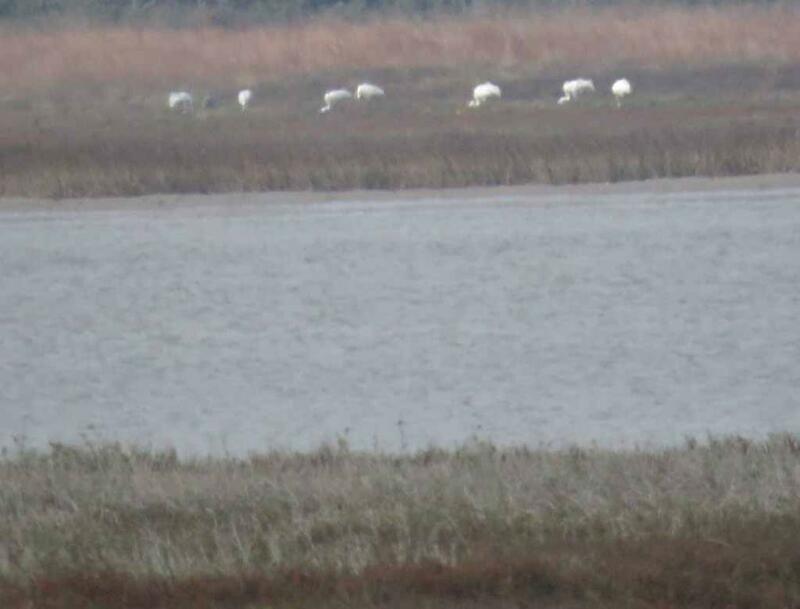 ponds in the middle are at least 100 yards away from visitors standing on the street or the road watching. 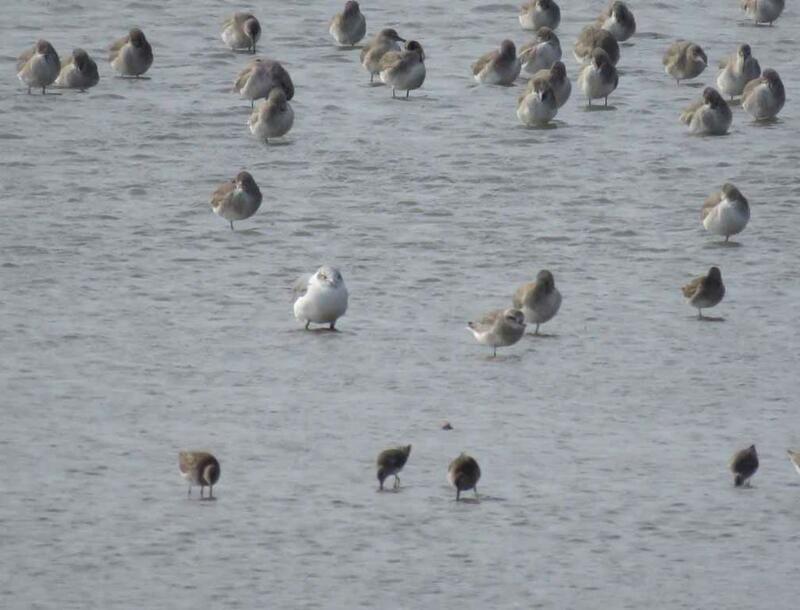 HS, with 65X optical zoom, with equivalent focal length of 1,365 mm. 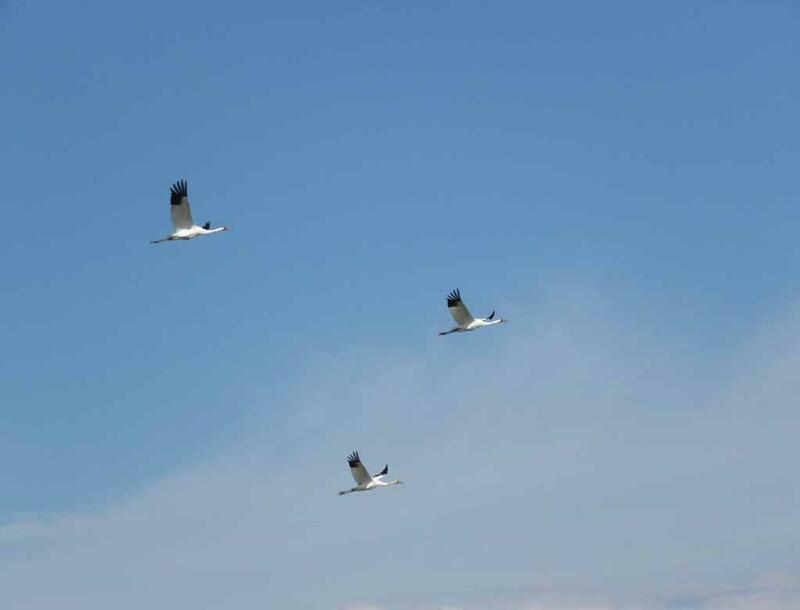 This family of three cranes are just flying in to this area. 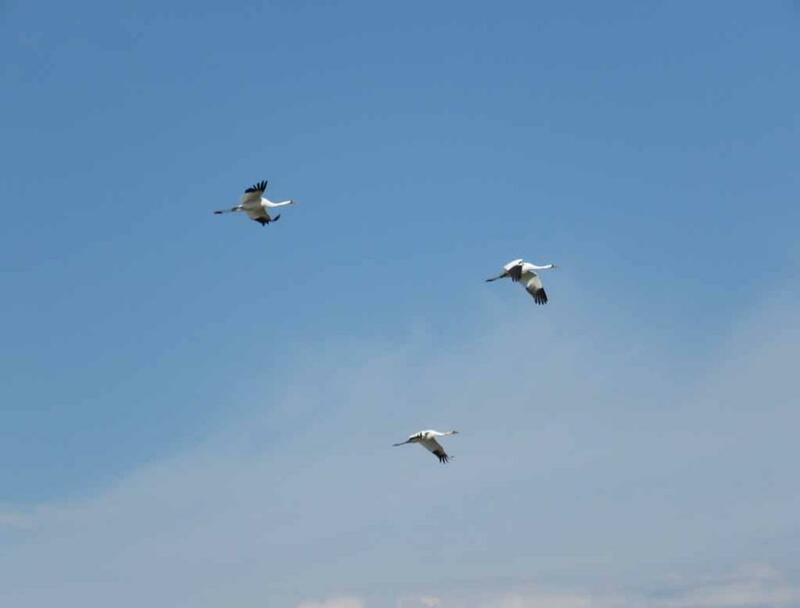 several shots in every second as long as the shutter release button is pressed down and held down. 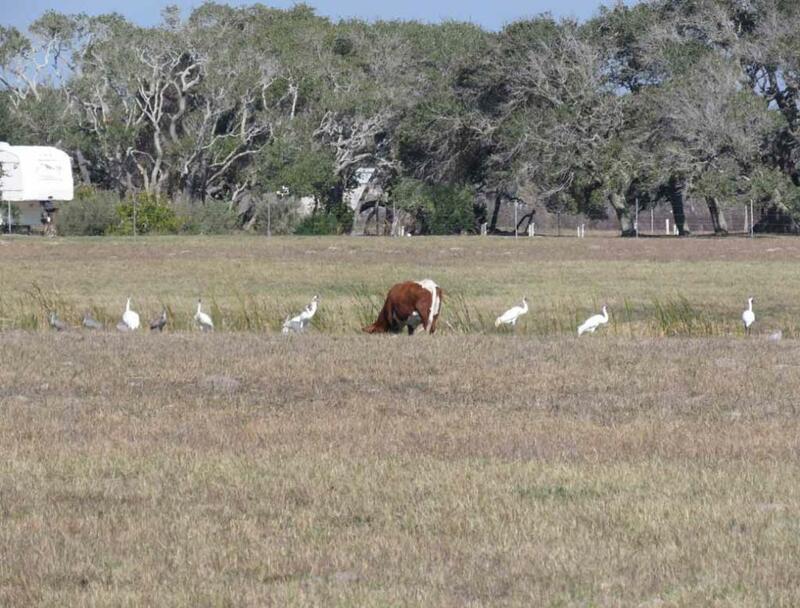 several cows near the ponds in the middle of this large grass field. 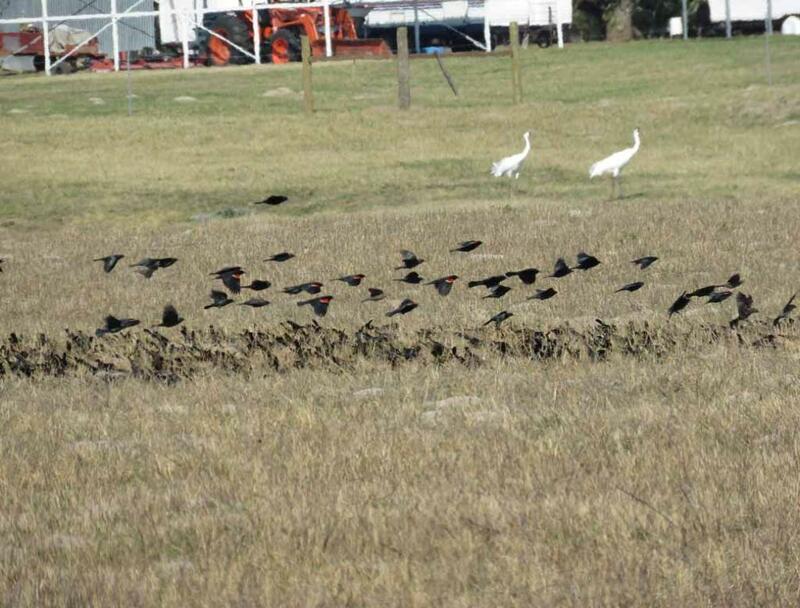 There are also many red winged black birds in the middle of this large grass field. 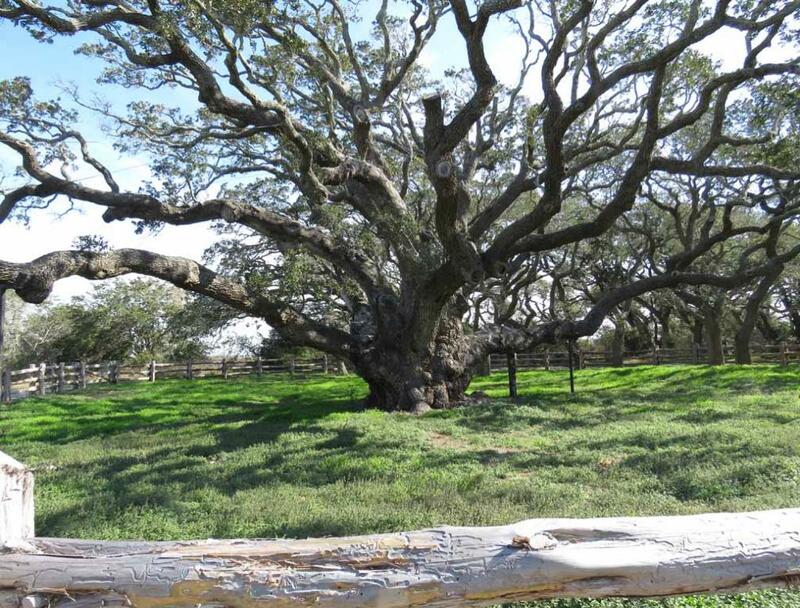 trunk. 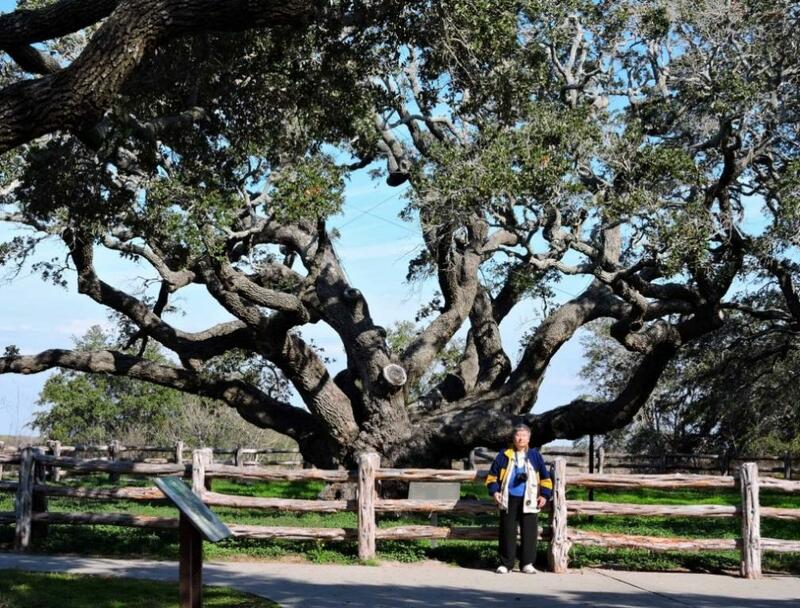 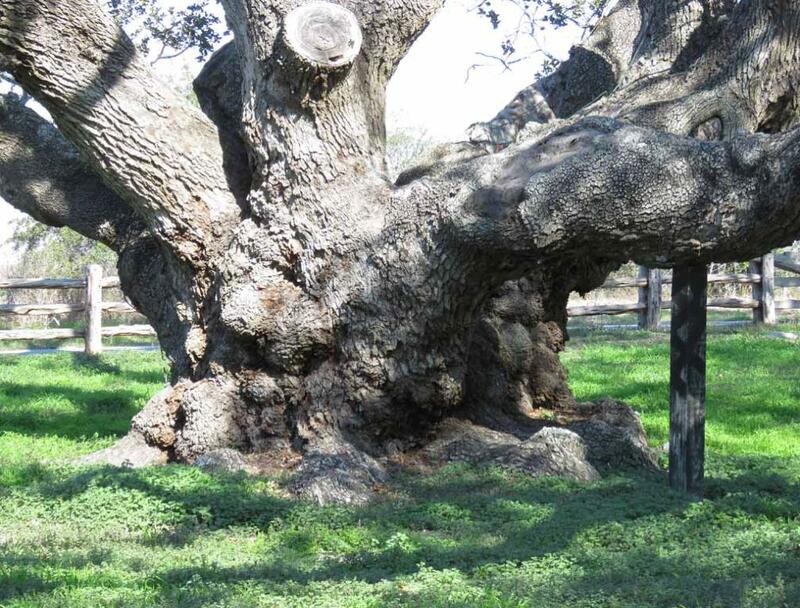 It withstood and survived hundreds of hurricanes. 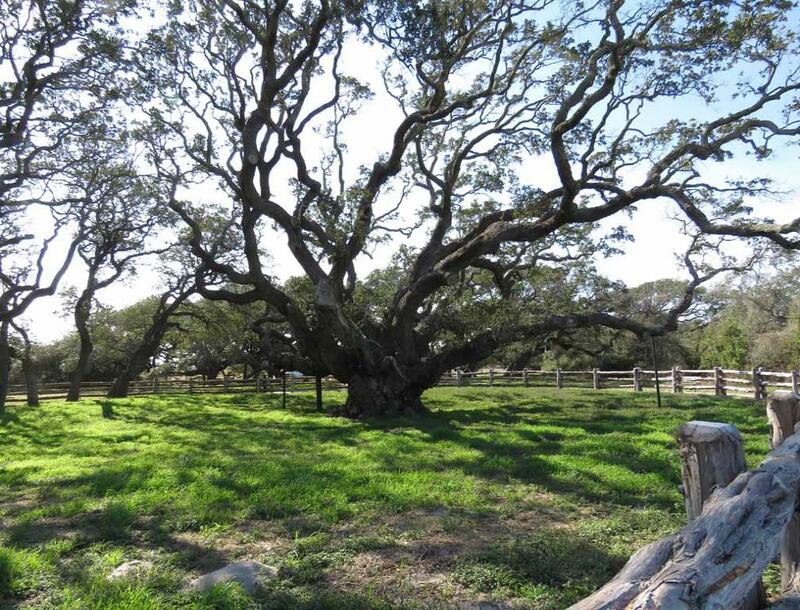 Island State Park is located at 202 Palmetto Street, Rockport, TX 78382. 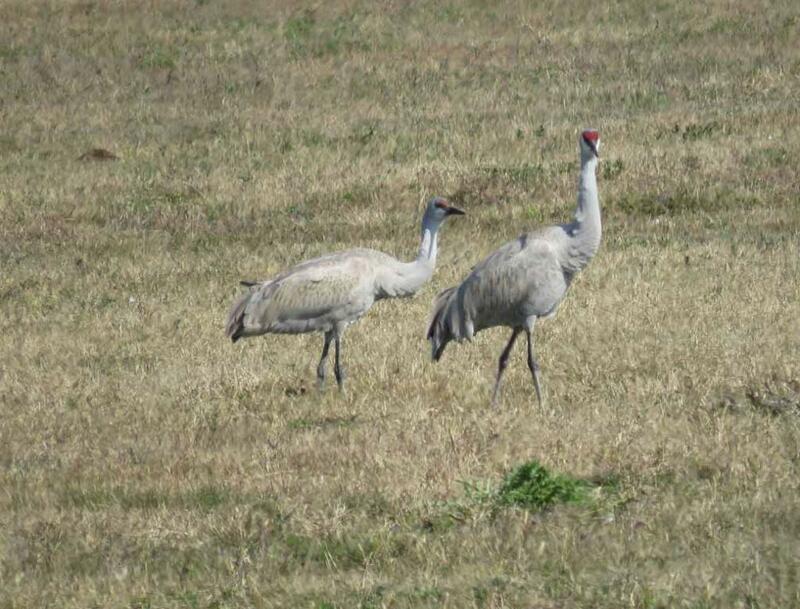 (kimonos) have large images of red-crowned cranes as symbol of happiness. 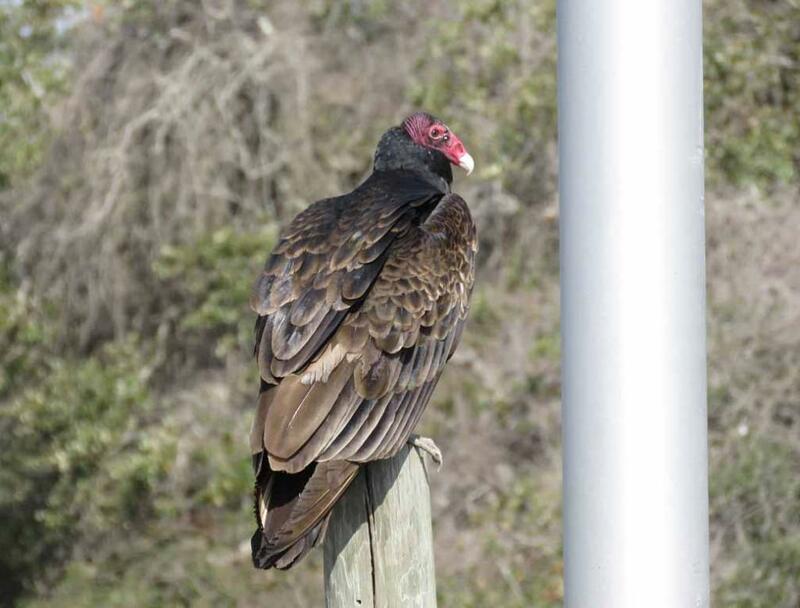 black wing tips are visible during flight. 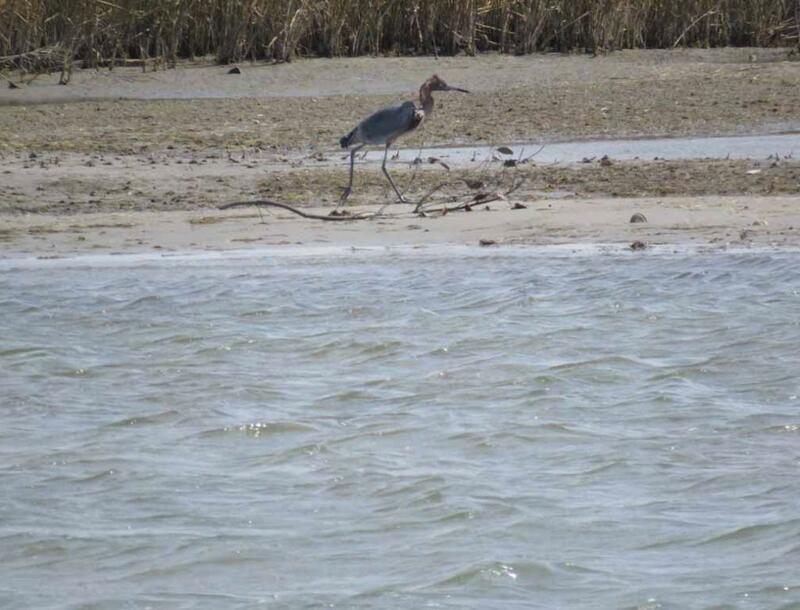 Wildlife Refuge and nearby areas along Texas Gulf Coast. 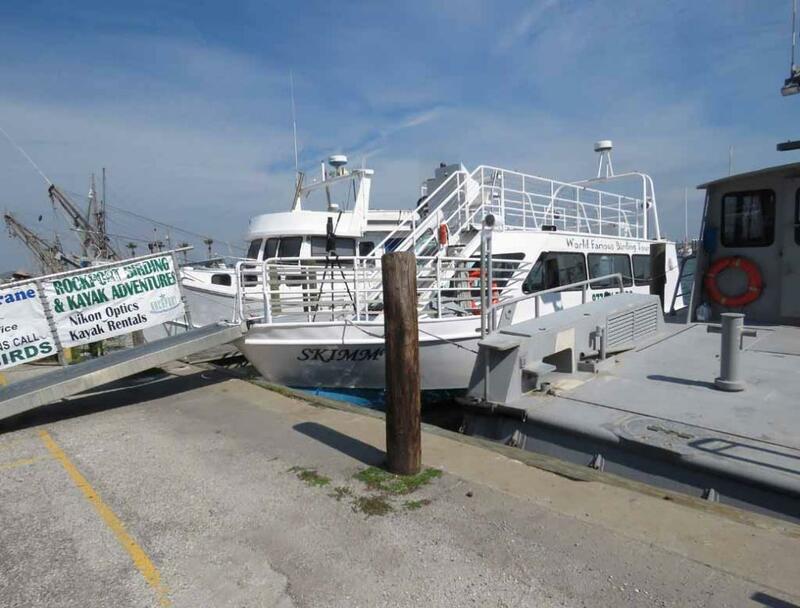 Map 3: click here for interactive Google Map showing location of Fulton Harbor. 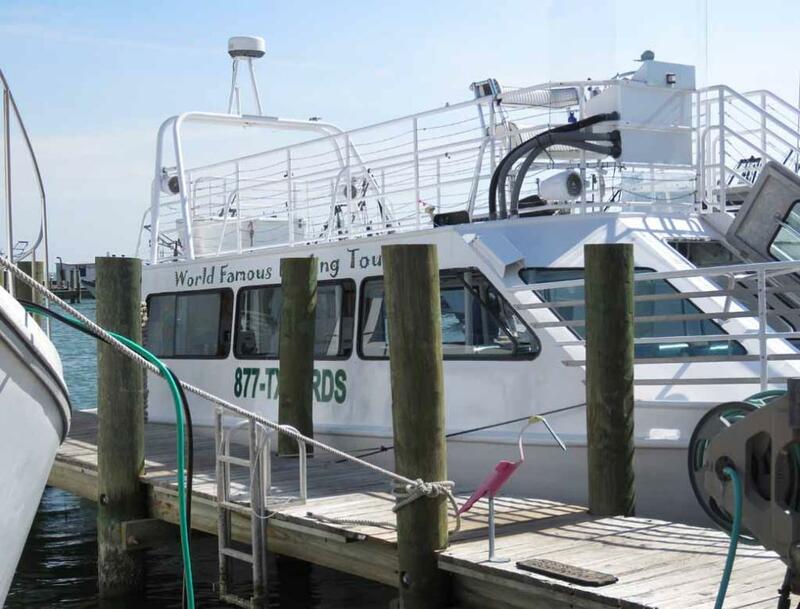 interested visitors to call ahead of time to make reservation because of the limited capacity of this tour boat. 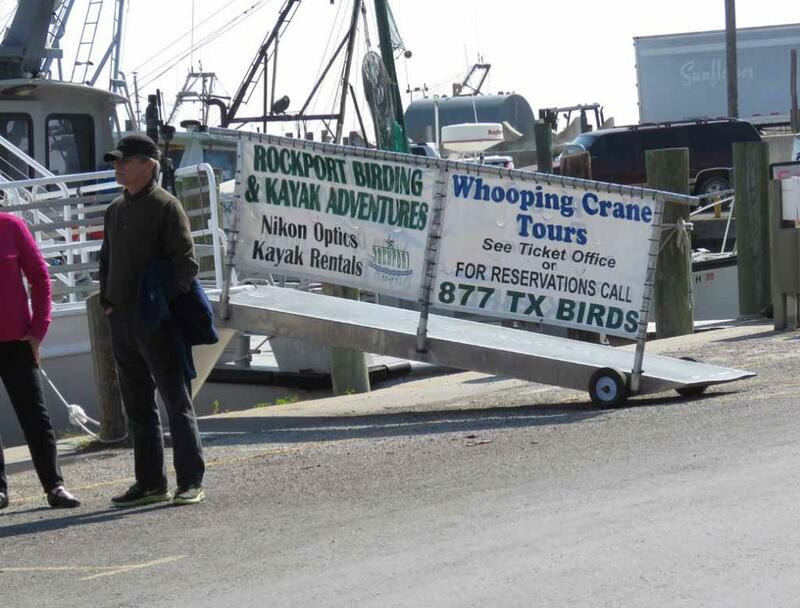 The ticket office is a small blue building on the roadside/parking lot of Fulton Harbor. 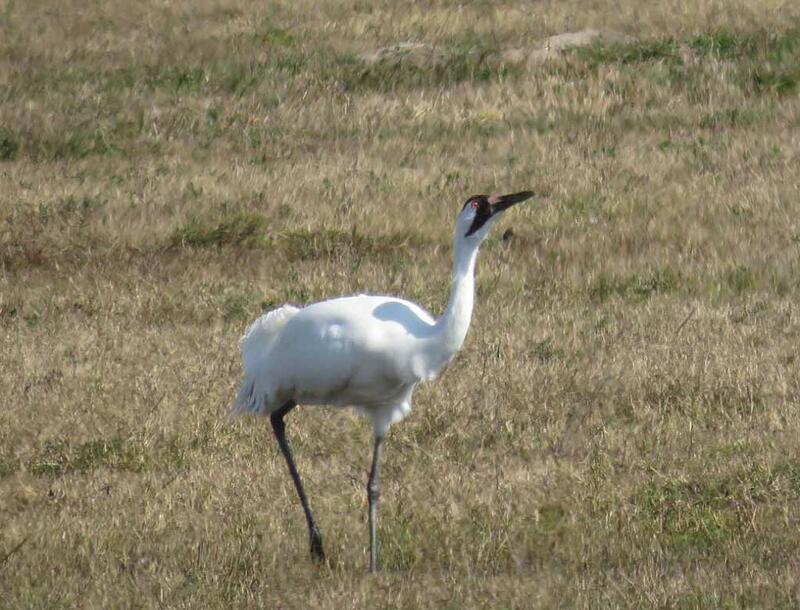 From the tour boat, we saw more red crowned white cranes (whooping cranes). 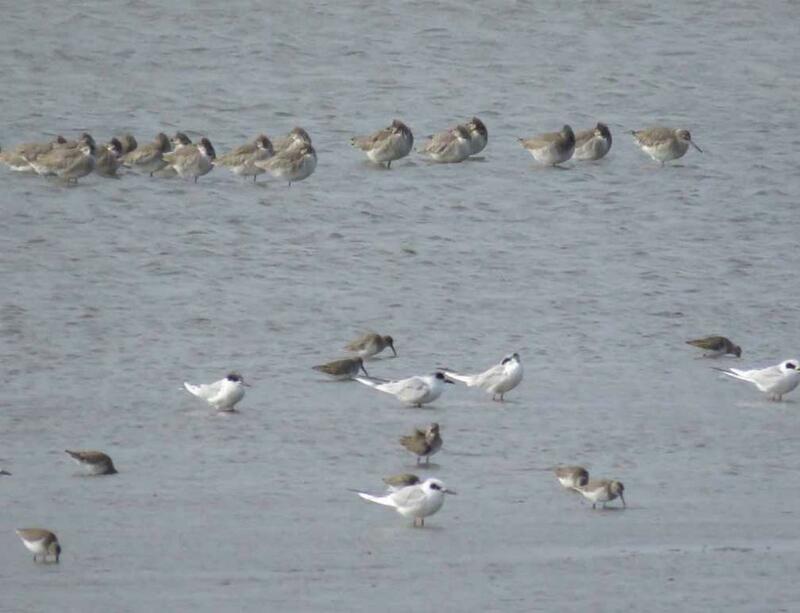 the bill into mud when something edible is encountered. 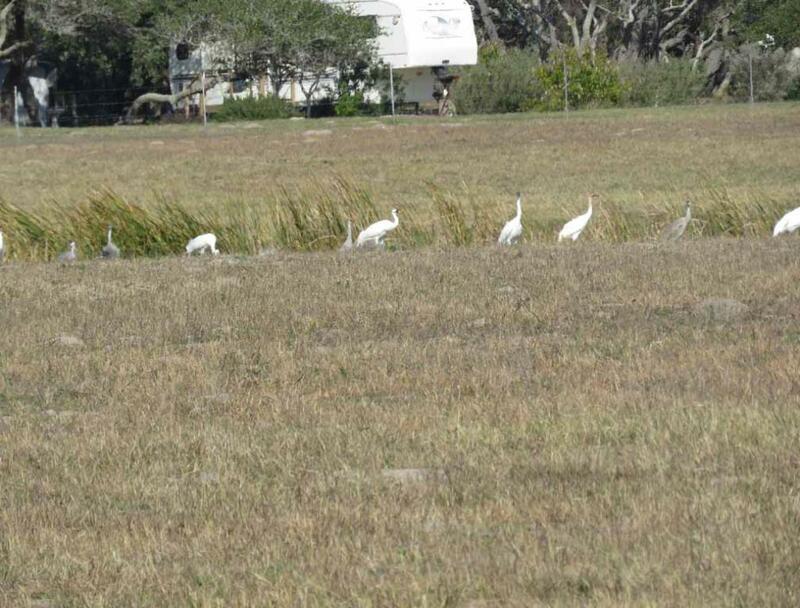 Island supports about one-third of the whopping crane flock, even more than Aransas National Wildlife Refuge. 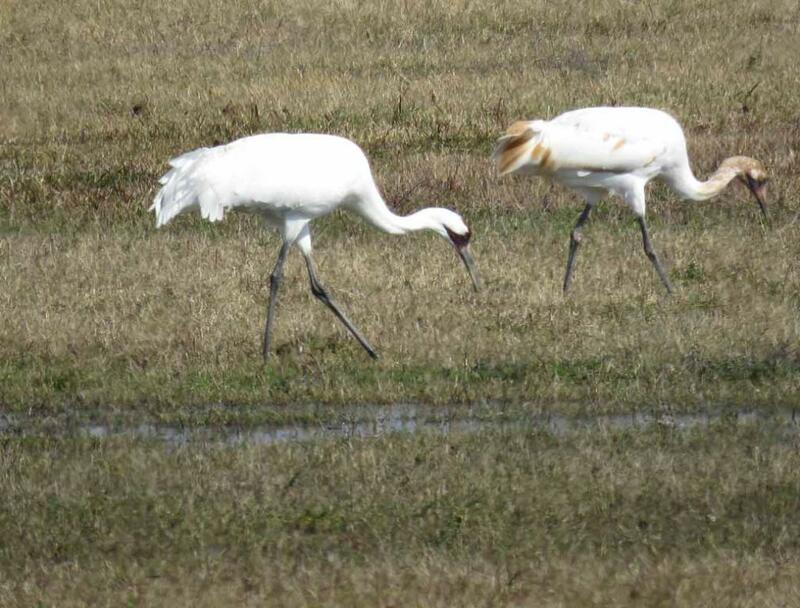 Whooping cranes as they forage in such areas. 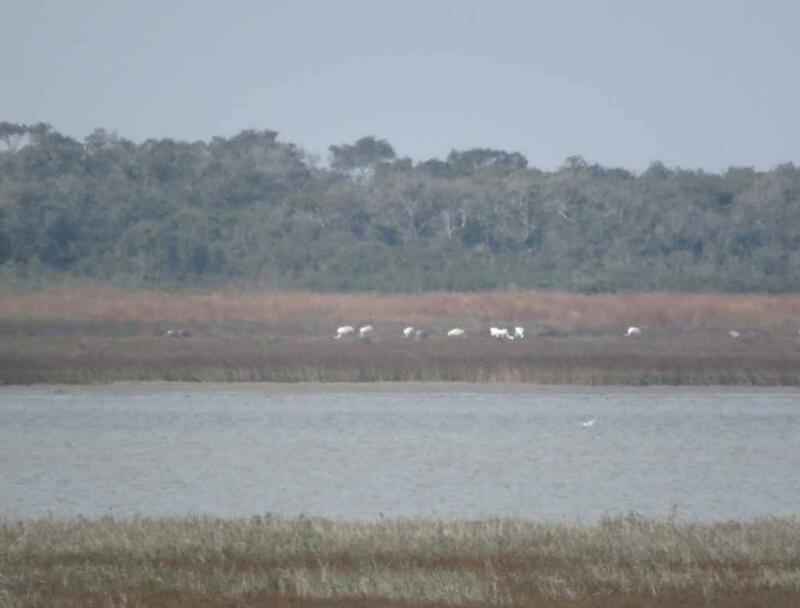 coastal saltwater marshes very far away. 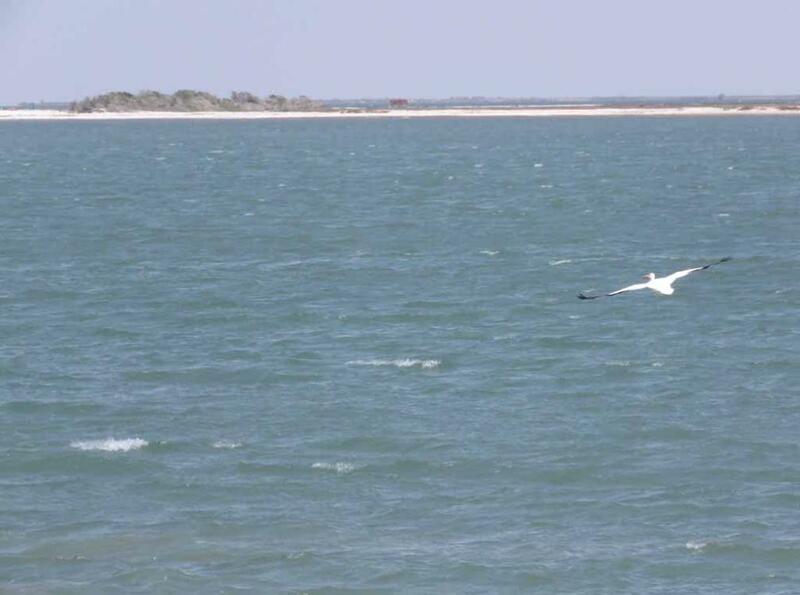 very far away along the shore. 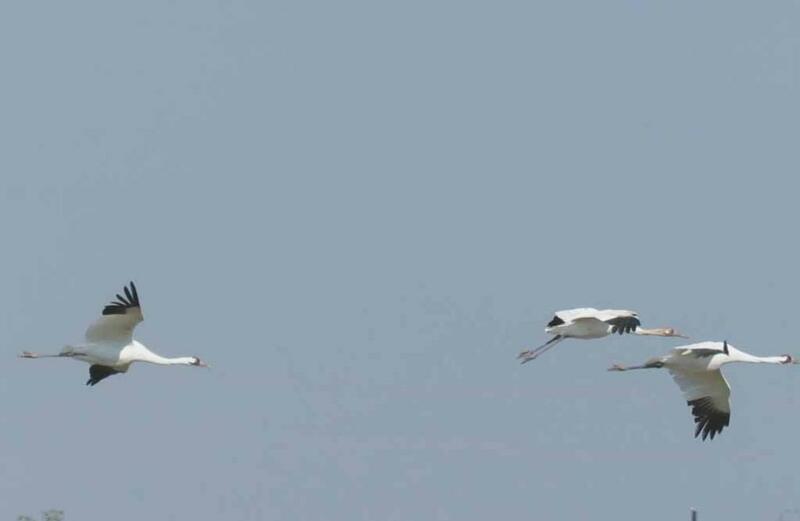 the burst, the cranes were totally out of the picture frame because of the shaking of the boat. 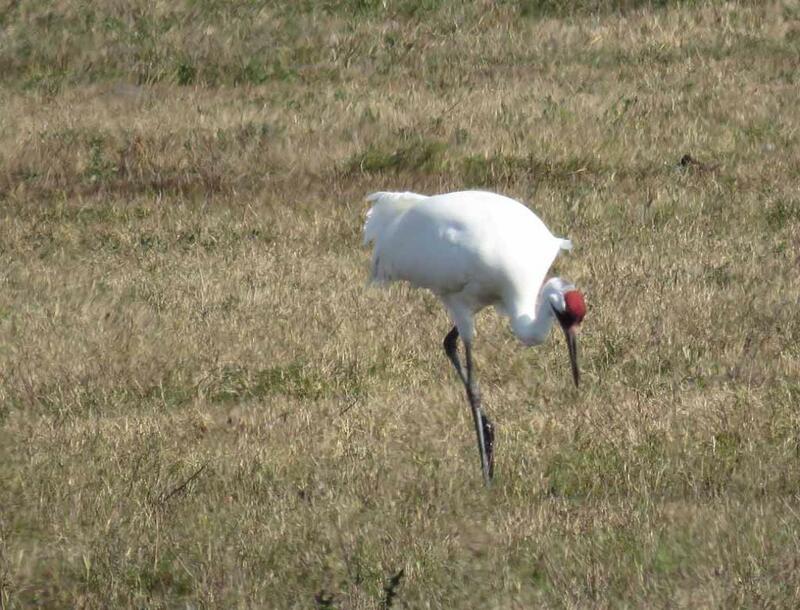 good pictures even with such provision of a tripod. 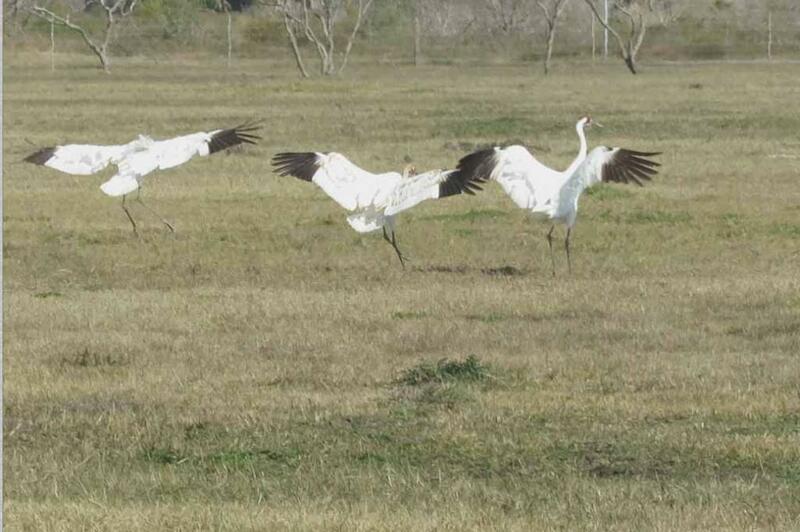 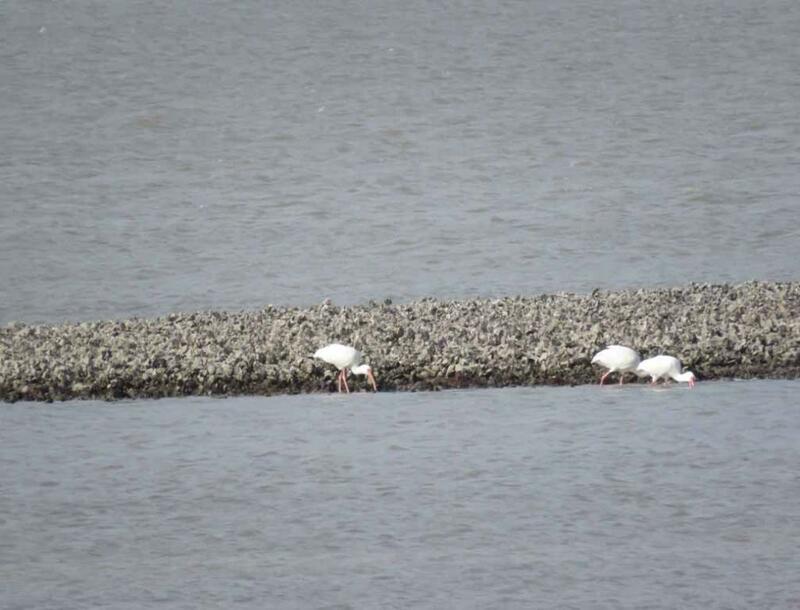 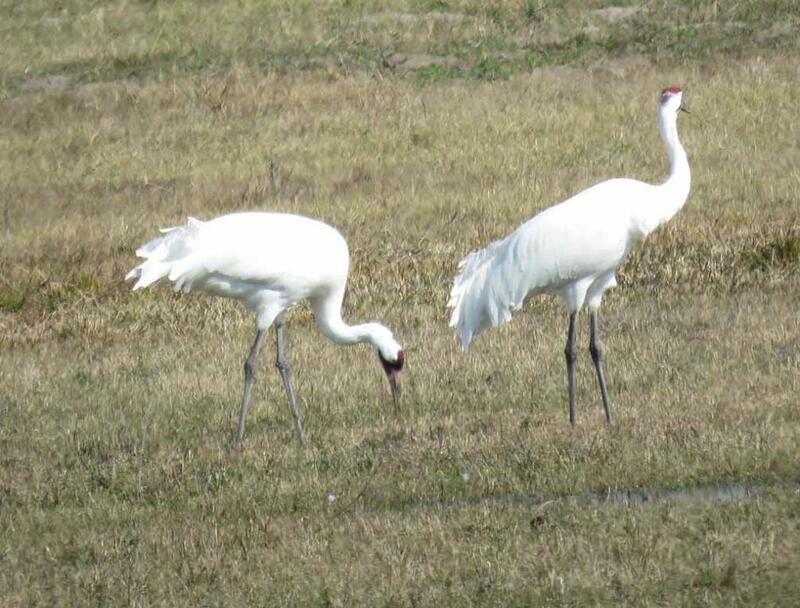 Some more sample photos of several whooping cranes that we saw from the tour boat. 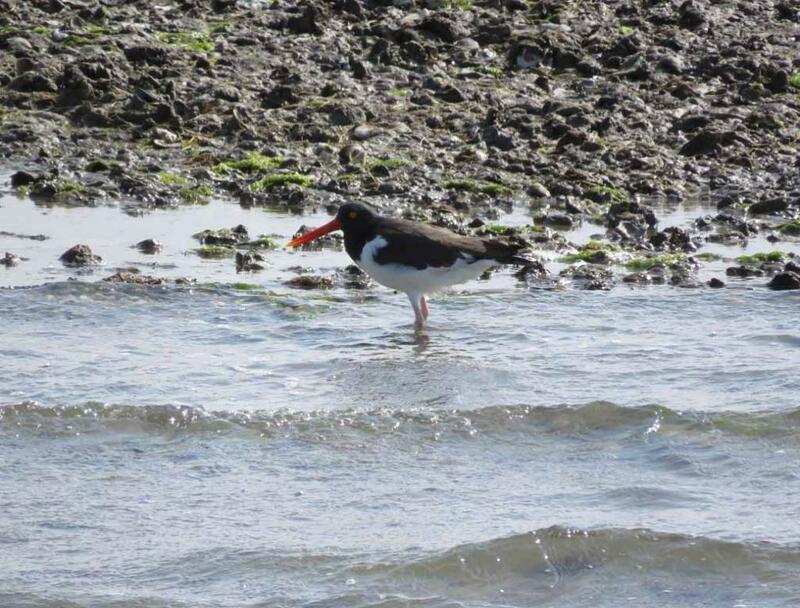 In addition to whooping cranes, we also saw many other kinds of birds, such as this American Oystercatcher. 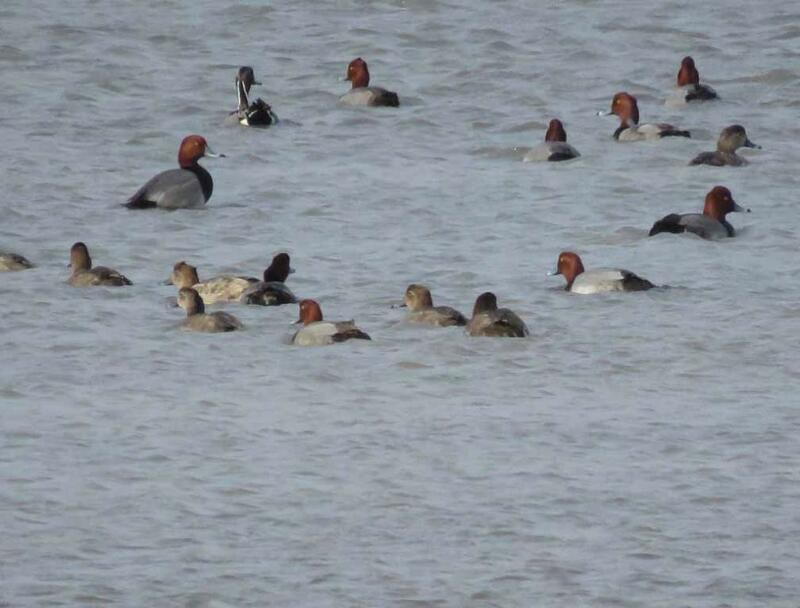 Many redheads and pintail water birds are flying low above water in this area. 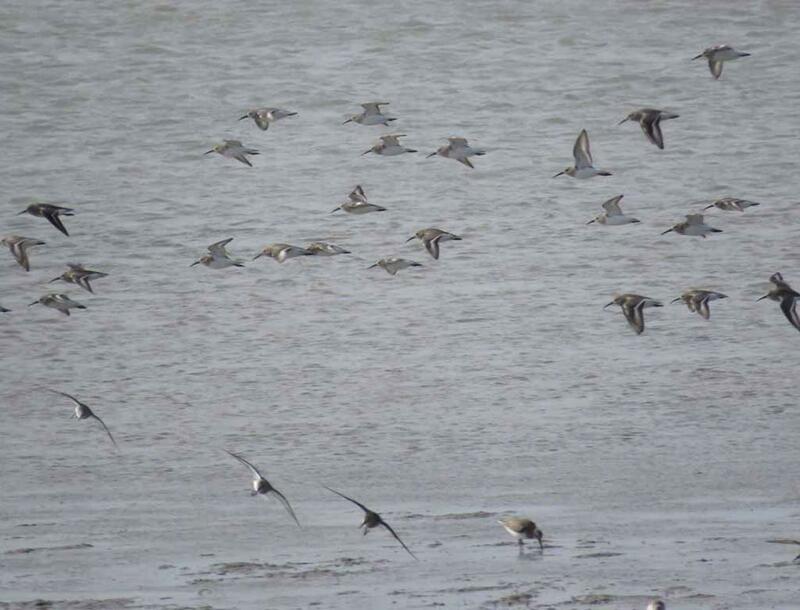 Many shorebirds in flight over the mudflats. 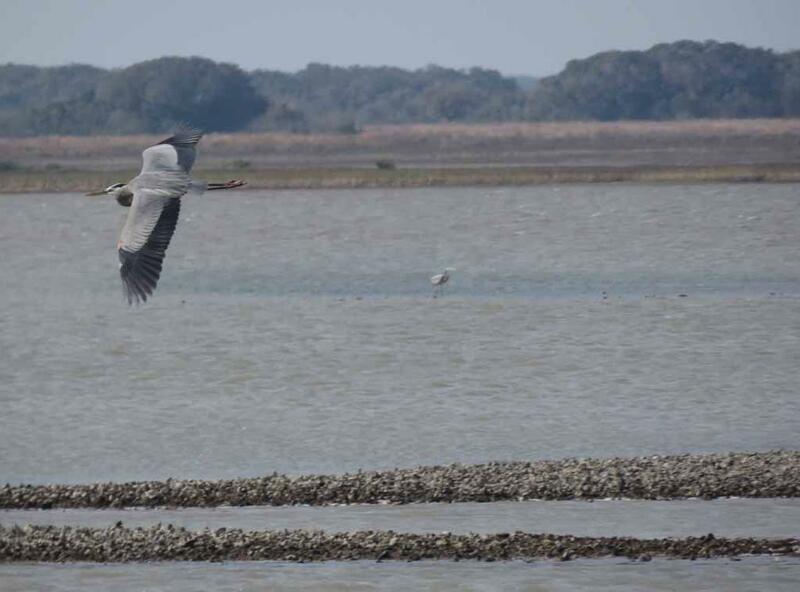 One of several great blue herons in the air. 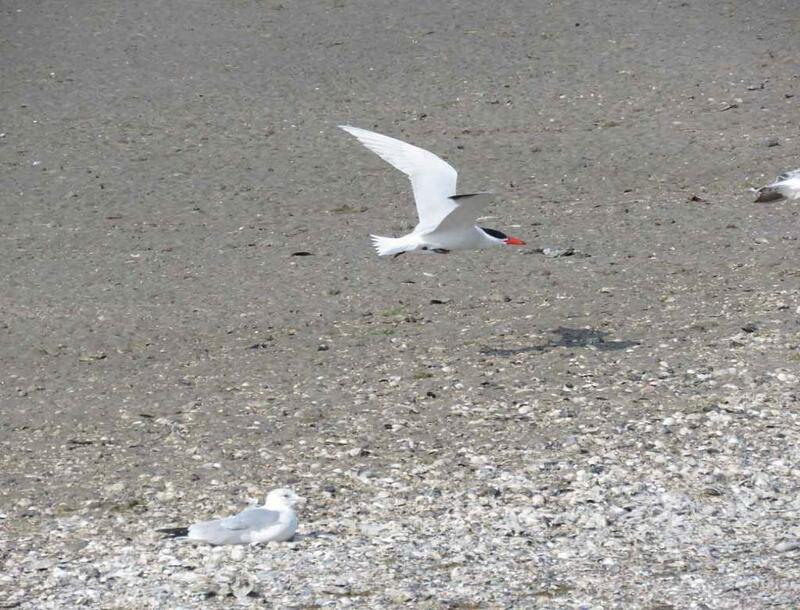 One of many beautiful Caspian terns flying low above the beach. 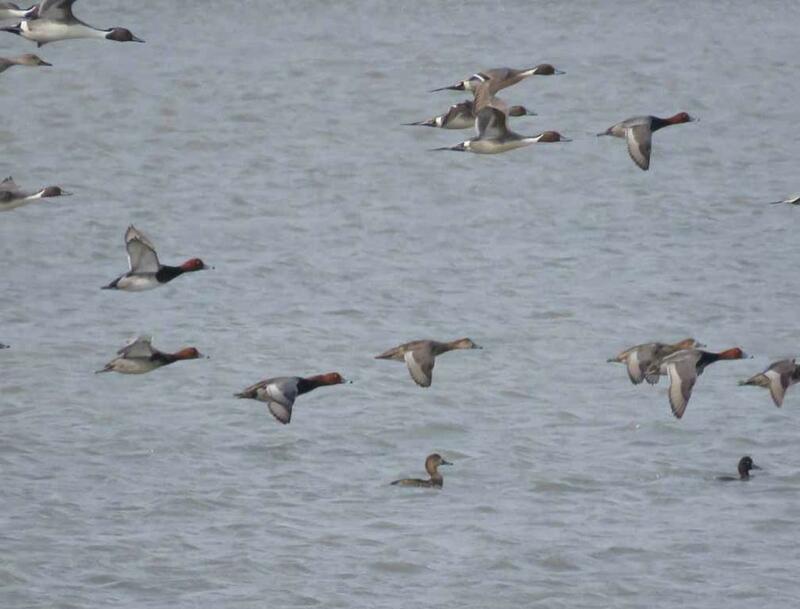 Some redheads and pintails on the water. 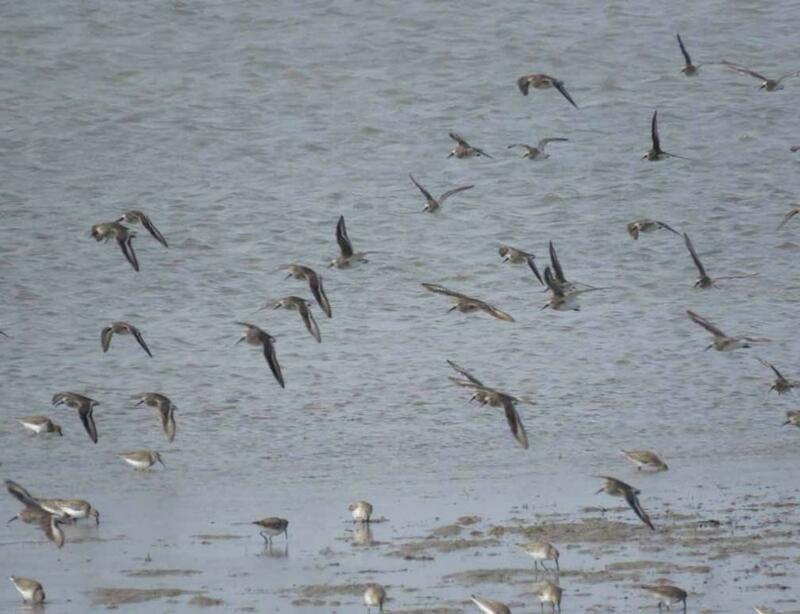 More shorebirds on the mudflat and in the air. 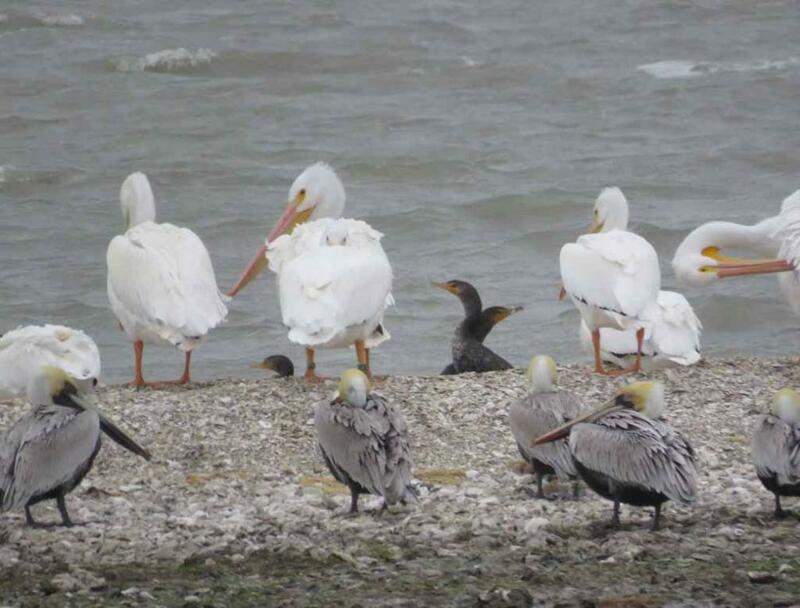 Some white pelicans, brown pelicans and cormorants. 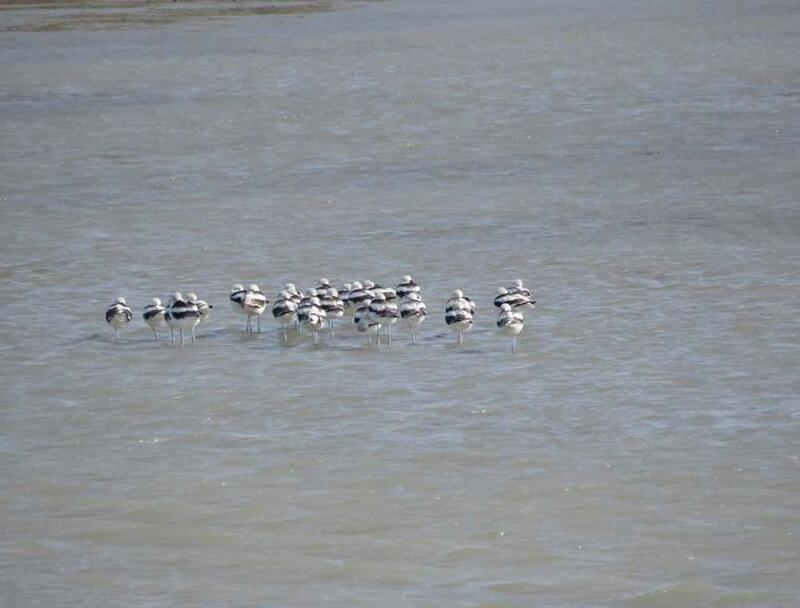 A flock of American Avocets. 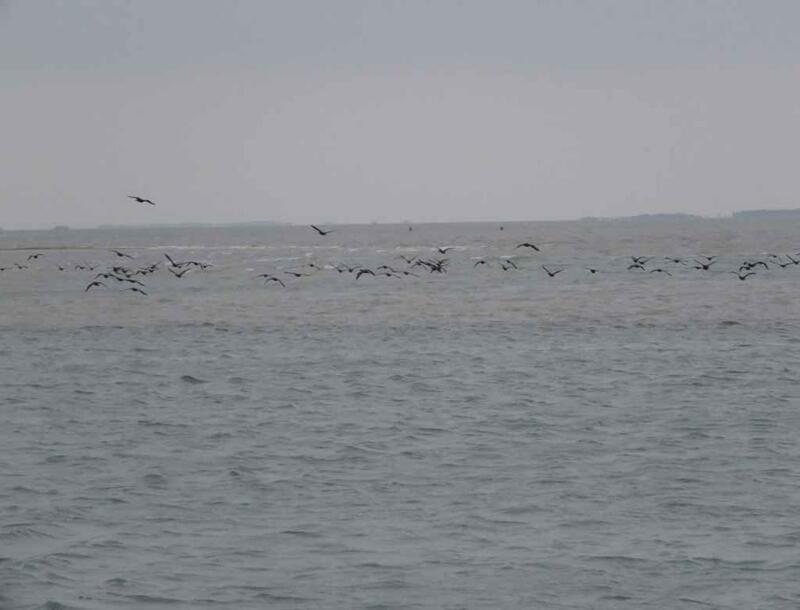 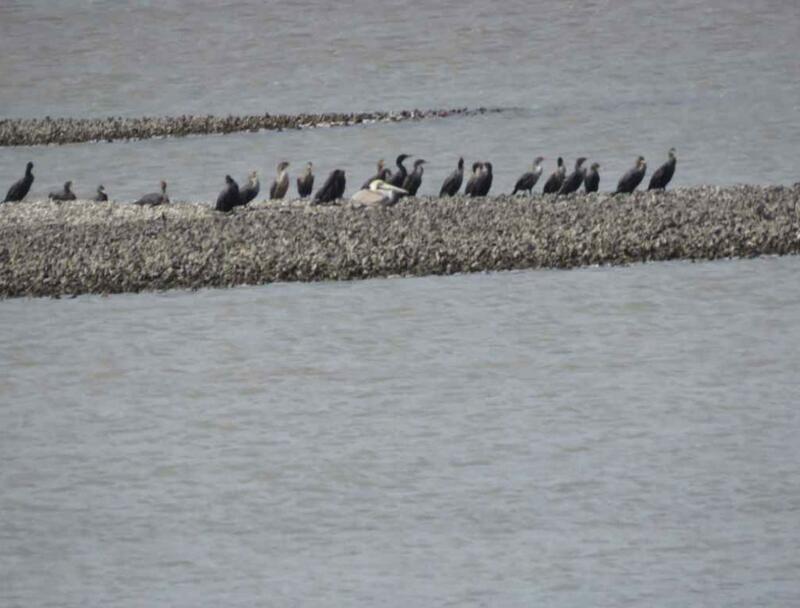 Many cormorants and some brown pelicans. 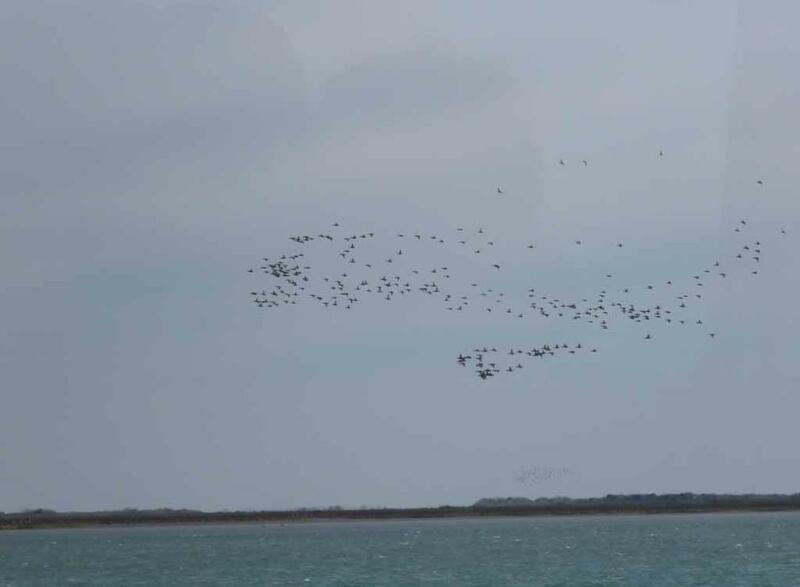 Two views of several large flocks of birds in the air far away seen during the boat tour. 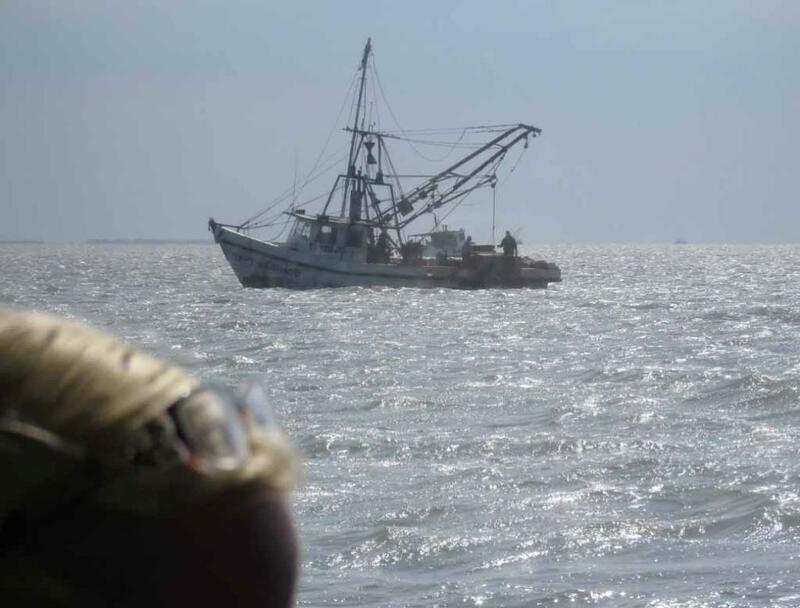 One of several fishing boats in the bay. 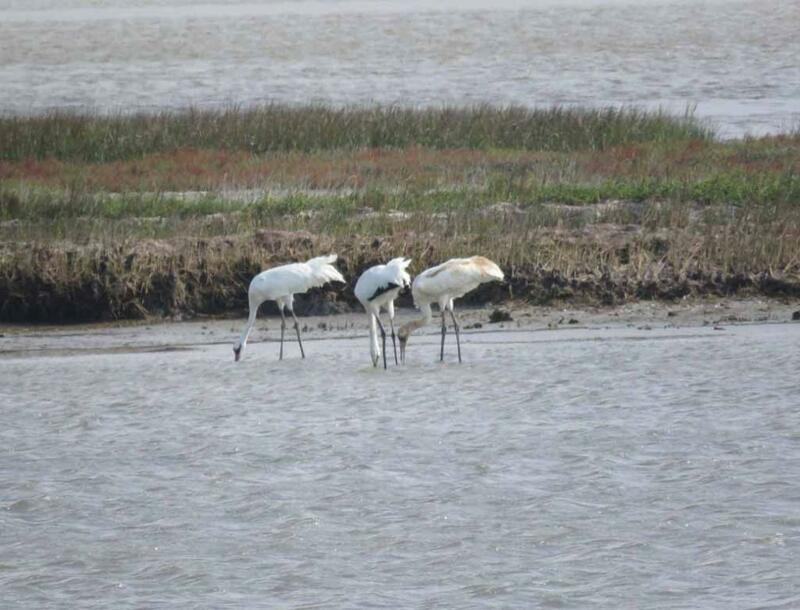 Some egrets along the shore. 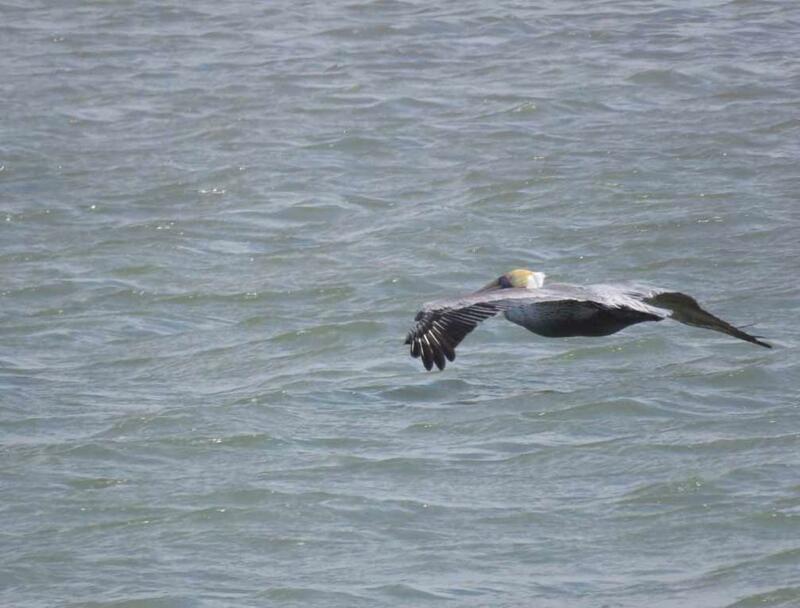 One of the brown pelicans flying just above the water surface. 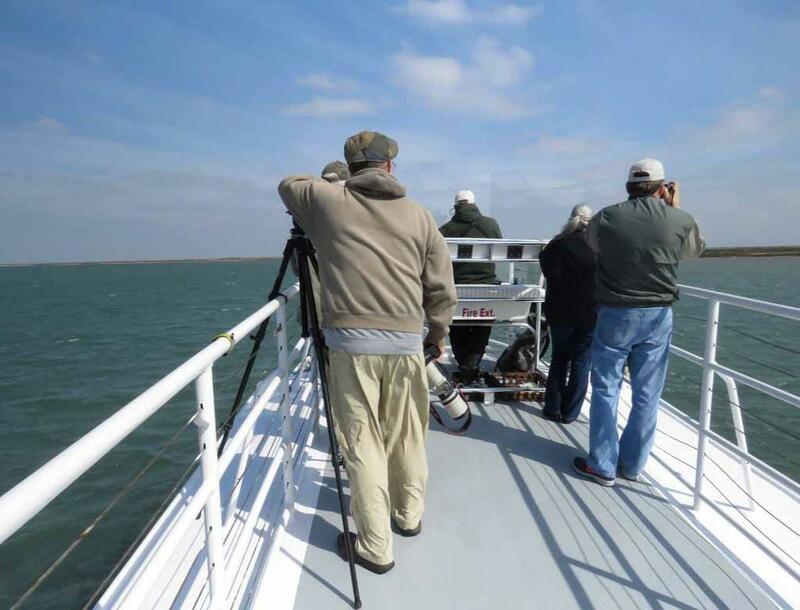 come here every winter to enjoy birding and warm weather along Texas Gulf Coast. 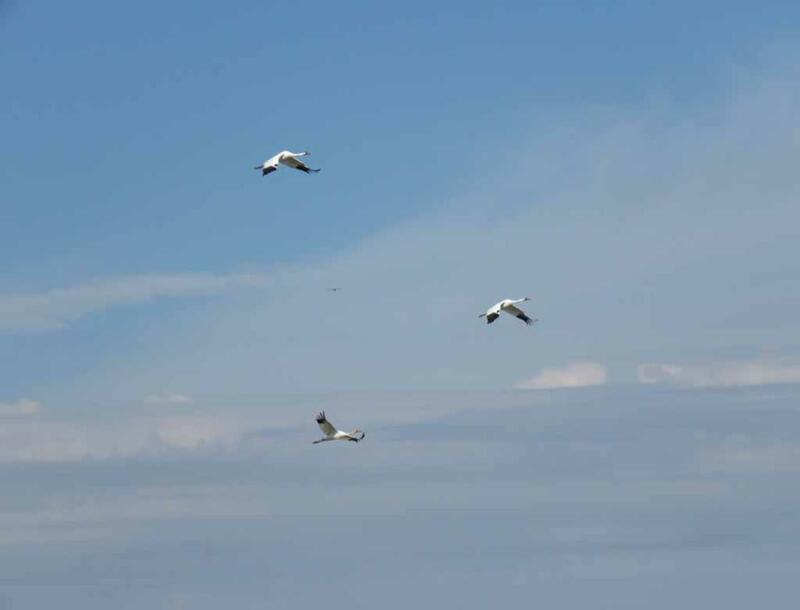 One of the white pelicans flying just above the water surface. 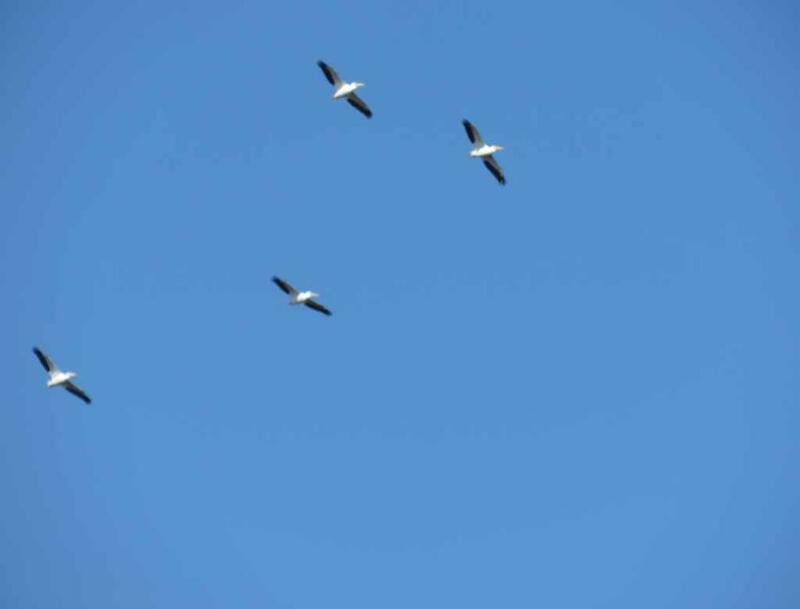 Several white pelicans also flew over this area. 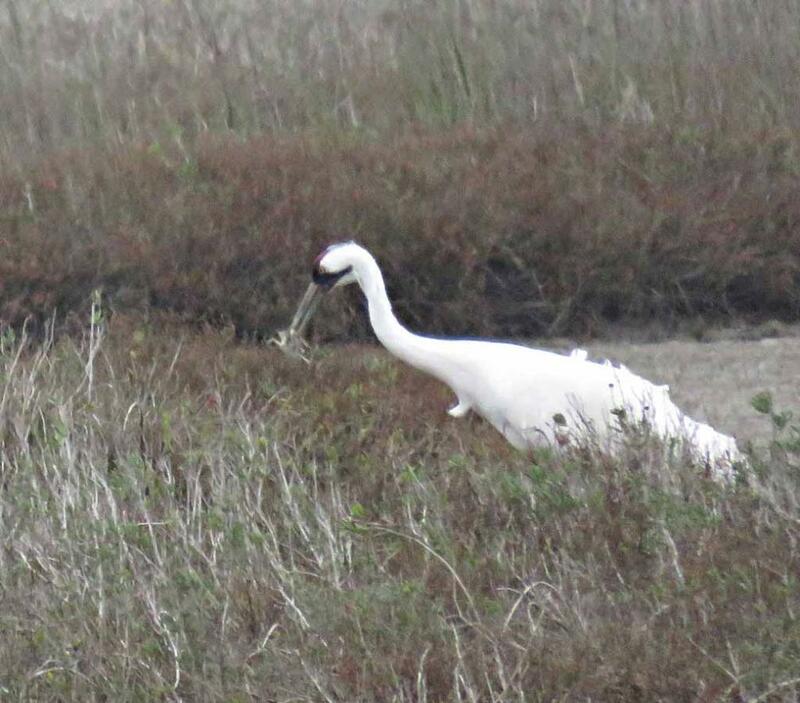 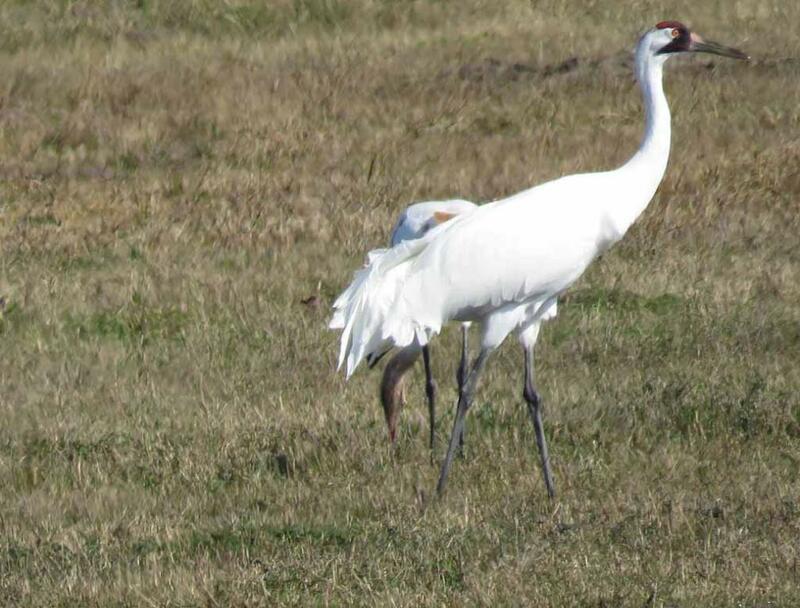 This whooping crane got a crab in its bills. 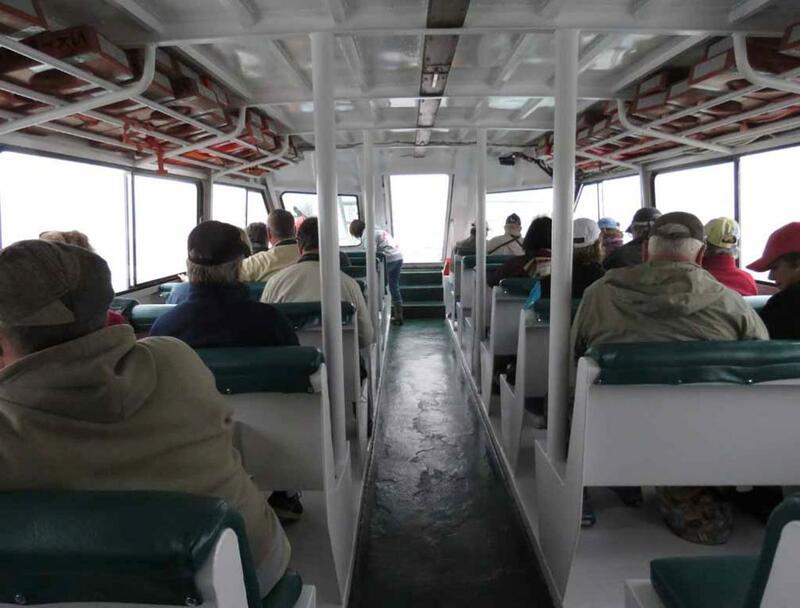 The inside, lower deck of the tour boat, Skimmer. 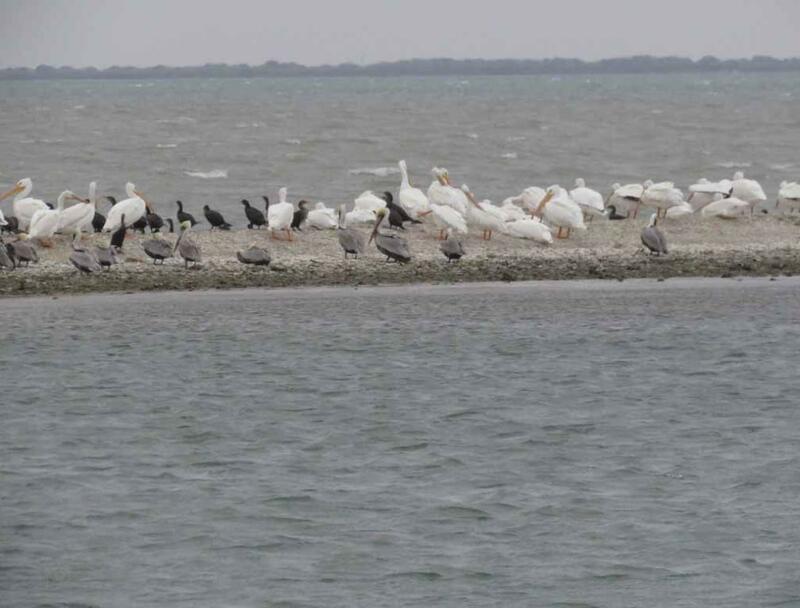 The white pelicans are bigger than brown pelicans. 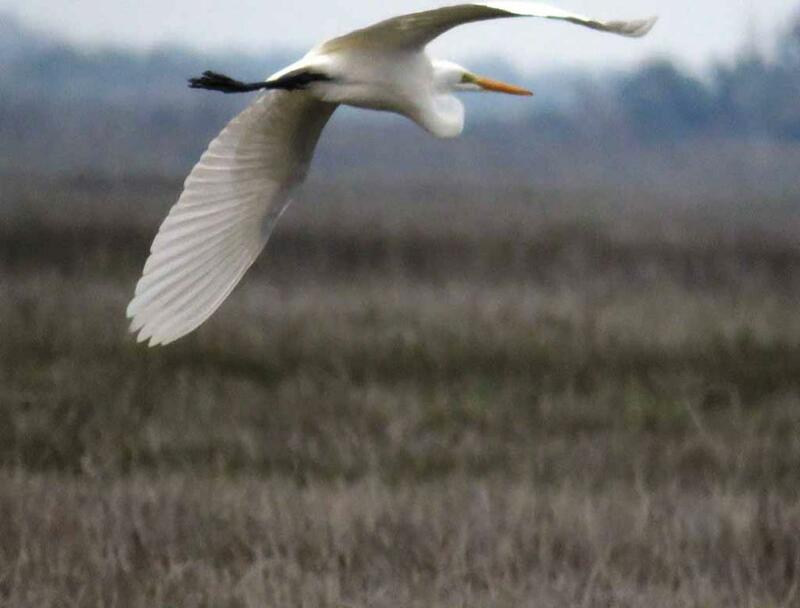 An egret in the air.